Kinkakuji (Jp. 金閣寺, Golden Pavilion Temple) is the common nickname of the Rokuonji (鹿苑寺, Deer Garden Temple) temple in Kyoto, Japan. The building was originally built in 1397 to serve as a retirement villa for Shogun Ashikaga Yoshimitsu. It was his son who converted the building into a Zen temple of the Rinzai school. The temple was burned down several times during the Onin War. The temple’s best known feature is the Golden Pavilion (金閣 kinkaku) in its garden. The entire pavilion except the basement floor is covered with pure gold leaf, making the temple extremely valuable. The pavilion functions as a shariden, housing relics of the Buddha. On the roof of the pavilion is a golden fenghuang or «Chinese phoenix» (Jp. 鳳凰 hôô). 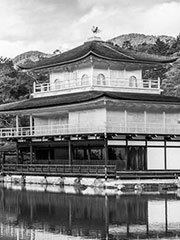 In 1950, the temple was burned down by a mentally disturbed monk; a fictionalized version of the events is at the center of Yukio Mishima’s 1956 book The Temple of the Golden Pavilion. The present structure dates from 1955.